We were working at FABLAB Ahmedabad where there are many CNC machines, and what we noticed was that they were pretty expensive and bulk. Also, being 3rd year Engineering students, it was the first time we heard about CNC machines. It might have been due to the fact that they are insanely expensive for all colleges to buy. 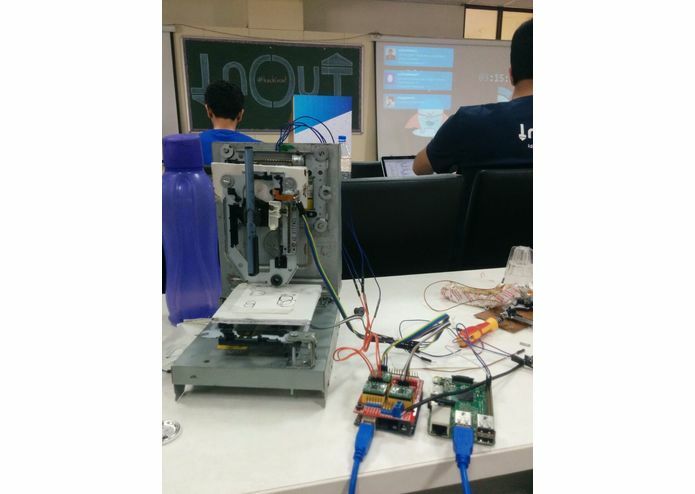 So we wanted to make a product that would enable students across universities to learn how to operate real time machines. 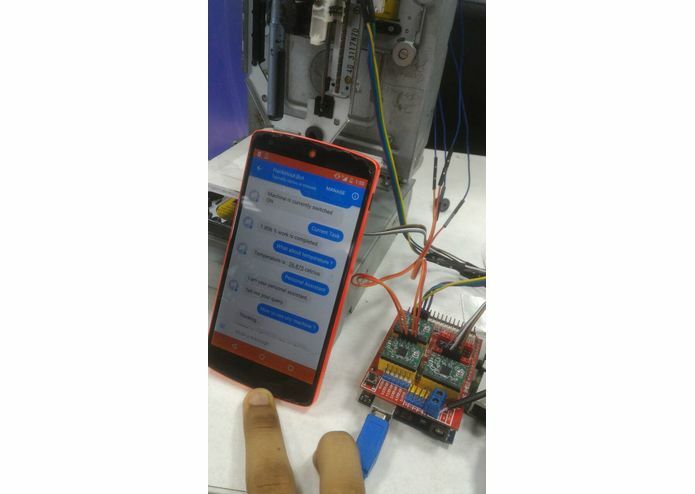 So what it does is that it is a miniature version of a Real time CNC machine, which students can use for educational purposes for school and colleges. It can pretty much do everything a real CNC machine can. 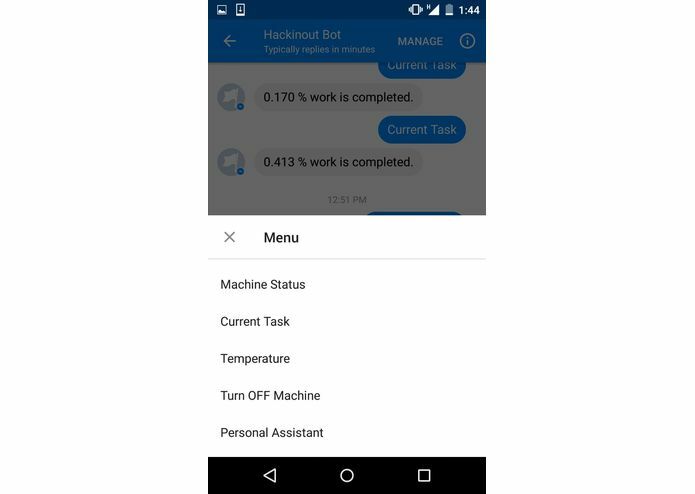 It is operated via Chat bot which has many features like real time analytics of work and temperature and a personal assistant fore help. For hardware, we purely built it out of scrap through old DVD drives. 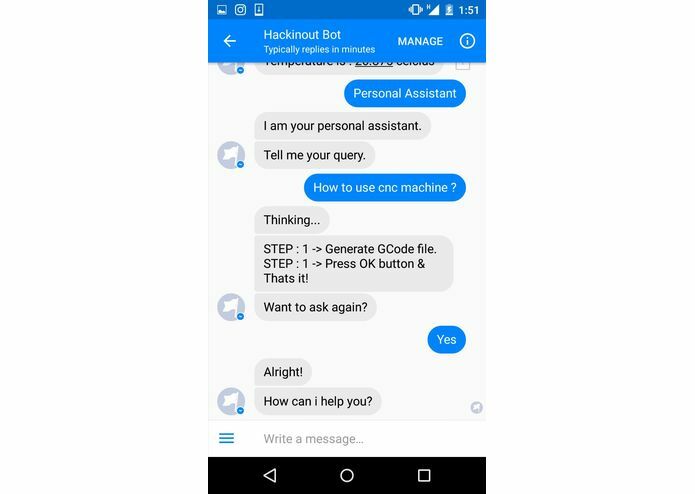 For software, we developed the Chat bot using python running inside Openshift Cloud. 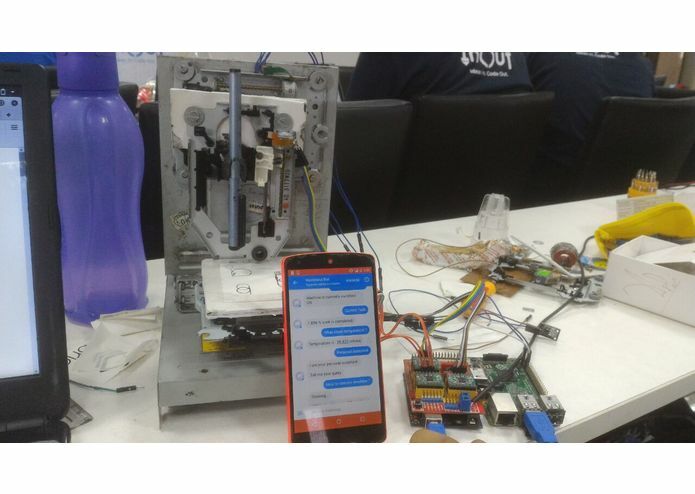 The most challenging part was connecting an AI bot with a piece of hardware, since there was no instructable even on the internet. We pretty much coded the whole project on our own from scratch. 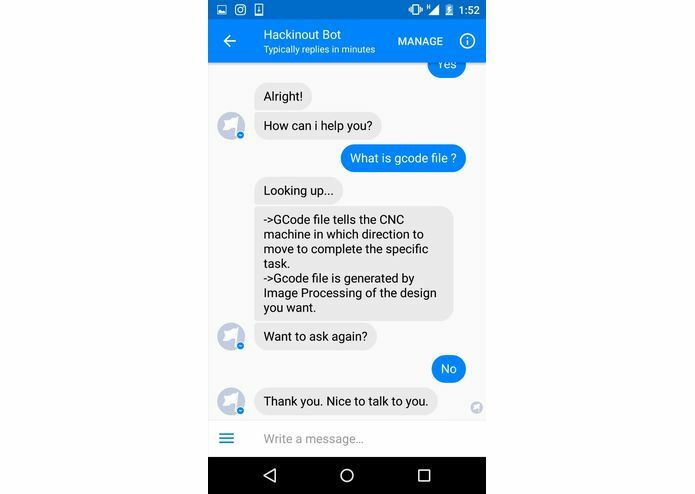 We are really proud of the fact that we were able to overcome our biggest hurdle, that was connection between hardware and a chat bot. We got a deeper understanding of the systems that we were working on. We finally were able to connect a piece of hardware to a Chat bot. We are planning on making it more stable and accurate, and if possible make it open source so many can benefit from it. Apart from this, we want to reach out to colleges and schools so students can benefit from this system. I worked in this project as a python programmer. 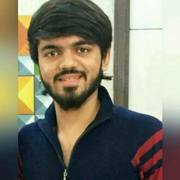 I built Facebook Messenger chatbot using Messenger API. 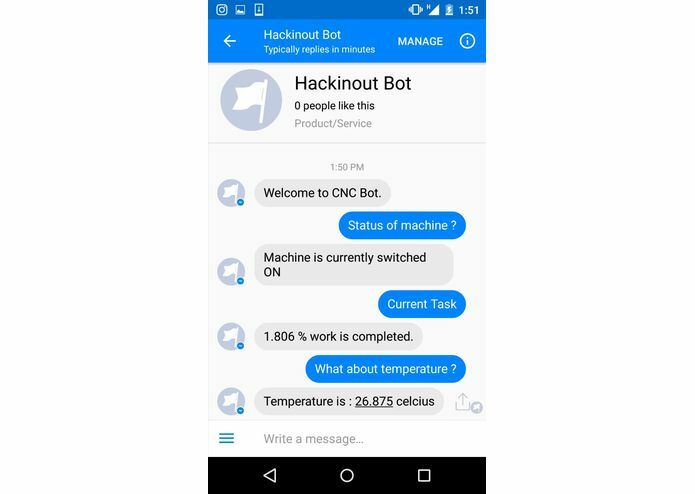 I created API and hosted on openshift to setup communication between Chatbot interaction and CNC machine. In short i worked as a software guy. 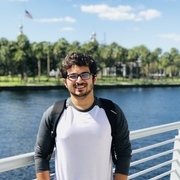 Computer Engineering undergrad student with the passion of startup product building using crazy coding skills. I worked on the hardware portion of the project, that is msking the CNC machine, Connecting it to Arduino and Raspberry Pi via serial communication. Hacker, Coder, Hardware enthusiast. Enough said.